Support Drug Guide: purchase the best generic medicine from our sponsor, online pharmacy store, where you can place an order and buy generic Myambutol online over the counter at lowest prices, worldwide delivery. Prices for Myambutol (Ethambutol) according to the dosage forms and number of pills. The more pills in a package, the lower the price for 1 pill! Ethambutol is authorised in the world under the following brand names: Dadibutol, Diambutol, Etibi, Myambutol, Tibutol. Ethambutol hydrochloride is a synthetic antituberculosis agent. 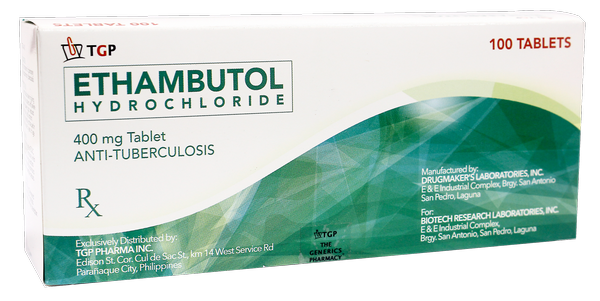 Ethambutol is used in conjunction with other antituberculosis agents in the treatment of clinical tuberculosis. The American Thoracic Society (ATS), US Centers for Disease Control and Prevention (CDC), and Infectious Diseases Society of America (IDSA) currently recommend several possible multiple-drug regimens for the treatment of culture-positive pulmonary tuberculosis. These regimens have a minimum duration of 6 months (26 weeks), and consist of an initial intensive phase (2 months) and a continuation phase (usually either 4 or 7 months). Ethambutol is considered a first-line antituberculosis agent for use in the initial phase of these regimens. In patients with previously untreated pulmonary tuberculosis, ethambutol usually is included in the initial phase of treatment in conjunction with isoniazid and rifampin (with or without pyrazinamide). In patients receiving a daily treatment regimen for the initial phase, the ATS, CDC, and IDSA state that ethambutol usually can be discontinued when in vitro susceptibility tests indicate that the strain of Mycobacterium tuberculosis is susceptible to isoniazid and rifampin. Ethambutol also is considered a first-line agent for use in multiple-drug regimens for the management of patients with drug-resistant pulmonary tuberculosis. Ethambutol is used in conjunction with other antituberculosis agents in the treatment of Mycobacterium avium complex (MAC) infections. The ATS currently recommends that therapy for MAC pulmonary infections in HIV-negative patients consist of at least 3 drugs, including clarithromycin (500 mg twice daily) or azithromycin (250 mg daily or 500 mg 3 times weekly), rifabutin (300 mg daily) or rifampin (600 mg daily), and ethambutol (25 mg/kg daily for 2 months, then 15 mg/kg daily). In addition, the ATS recommends therapy that includes either clarithromycin or azithromycin combined with ethambutol and rifabutin for the treatment of disseminated MAC infection in HIV-infected patients. The choice of the drug regimen should be made in consultation with an expert. To prevent recurrence of MAC infections, maintenance therapy (secondary prophylaxis) is recommended for all HIV-infected adults, adolescents, and children who have previously been treated for disseminated MAC infection. Unless there is clinical or laboratory evidence of macrolide resistance, the Prevention of Opportunistic Infections Working Group of the US Public Health Service and Infectious Diseases Society of America (USPHS/IDSA) recommends a regimen of clarithromycin (or azithromycin) in conjunction with ethambutol with or without rifabutin for secondary MAC prophylaxis. Secondary MAC prophylaxis after disseminated MAC infection in HIV-infected adults and adolescents generally is recommended for life, unless there is immune recovery in response to highly active antiretroviral therapy (HAART). There is some evidence that the risk for recurrence of MAC is low in adults and adolescents who have completed at least 12 months of MAC therapy, have remained asymptomatic with respect to MAC signs and symptoms, and have a sustained (e.g., for 6 months or longer) increase in CD4+ T-cell counts to greater than 100/mm3 as the result of potent antiretroviral therapy. Based on these data and more extensive cumulative data regarding the safety of discontinuing secondary prophylaxis for other opportunistic infections, the USPHS/IDSA states that it is reasonable to consider discontinuance of secondary MAC prophylaxis in adults and adolescents meeting these criteria. To substantiate that the disease is no longer active, some experts would obtain a blood culture for MAC (even in asymptomatic patients) prior to discontinuing secondary MAC prophylaxis. The USPHS/IDSA recommends that secondary MAC prophylaxis be reinitiated if CD4+ T-cell counts subsequently decrease to less than 100/mm3. The safety of discontinuing secondary MAC prophylaxis in HIV-infected children whose CD4+ T-cell count has increased in response to HAART has not been studied. Therefore, the USPHS/IDSA recommends that HIV-infected children with a history of disseminated MAC infection receive lifelong secondary MAC prophylaxis. Ethambutol hydrochloride is administered orally. In the treatment of clinical tuberculosis, ethambutol should not be given alone. The drug is considered a first-line agent for use in patients with tuberculosis. Therapy for tuberculosis should be continued long enough to prevent relapse. The minimum duration of treatment currently recommended for patients with culture-positive pulmonary tuberculosis is 6 months (26 weeks), and recommended regimens consist of an initial intensive phase (2 months) and a continuation phase (usually either 4 or 7 months). However, completion of treatment is determined more accurately by the total number of doses and is not based solely on the duration of therapy. The manufacturer states that the usual adult dosage of ethambutol hydrochloride for use in conjunction with other antituberculosis agents in previously untreated patients is 15 mg/kg once daily. In adults who have received previous antituberculosis therapy, the usual dosage recommended by the manufacturer for use in conjunction with other antituberculosis agents is 25 mg/kg daily for 60 days or until bacteriologic smears and cultures become negative, followed by 15 mg/kg daily. The American Thoracic Society (ATS), US Centers for Disease Control and Prevention (CDC), and Infectious Diseases Society of America (IDSA) recommend that when ethambutol hydrochloride is used in an initial regimen that involves daily administration of antituberculosis agents, adults and children 15 years of age or older weighing 40-55 kg should receive a dosage of 800 mg, those weighing 56-75 kg should receive 1.2 g, and those weighing 76-90 kg should receive 1.6 g. The maximum daily dosage recommended is 1.6 g regardless of weight. If ethambutol hydrochloride is used in an intermittent regimen that involves twice-weekly administration of antituberculosis agents, the ATS, CDC, and IDSA recommend that adults and children 15 years of age or older weighing 40-55 kg should receive a dosage of 2 g, those weighing 56-75 kg should receive 2.8 g, and those weighing 76-90 kg should receive 4 g; the maximum dosage for this regimen is 2.4 g regardless of weight. If a 3-times weekly regimen is used, adults weighing 40-55 kg should receive a dosage of 1.2 g, those weighing 56-75 kg should receive 2 g, and those weighing 76-90 kg should receive 2.4 g; the maximum dosage for this regimen is 4 g regardless of weight. The manufacturer states that ethambutol hydrochloride is not recommended for use in children younger than 13 years of age. The ATS, CDC, and IDSA state that ethambutol should be used with caution in children in whom it may be difficult to monitor visual acuity (e.g., those younger than 5 years of age). If ethambutol hydrochloride is used in pediatric patients, the ATS, CDC, and IDSA recommend a dosage of 15-20 mg/kg daily (up to 1 g) or a dosage of 50 mg/kg twice weekly (up to 2.5 g). The American Academy of Pediatrics recommends a pediatric dosage of 15-25 mg/kg daily or 50 mg/kg twice weekly (up to 2.5 g). When ethambutol hydrochloride is used in conjunction with other antituberculosis agents for the treatment of pulmonary Mycobacterium avium complex (MAC) infections in adults not infected with the human immunodeficiency virus (HIV), a dosage of 25 mg/kg daily for 2 months, followed by 15 mg/kg daily thereafter, has been recommended by ATS. Therapy should continue until the patient has been culture negative for 1 year. When ethambutol hydrochloride is used in conjunction with other antituberculosis agents for the treatment of disseminated MAC infection, a dosage of 15 mg/kg daily has been recommended by ATS. For maintenance therapy to prevent recurrence of disseminated MAC infection (secondary prophylaxis), the Prevention of Opportunistic Infections Working Group of the US Public Health Service and the Infectious Diseases Society of America (USPHS/IDSA) recommends that adults or adolescents receive clarithromycin (500 mg twice daily) or azithromycin (500 mg once daily) in conjunction with ethambutol hydrochloride (15 mg/kg once daily), with or without rifabutin (300 mg once daily). For maintenance therapy to prevent recurrence of disseminated MAC infection (secondary prophylaxis), the USPHS/IDSA recommends that infants and children receive clarithromycin (7. mg/kg [maximum 500 mg] daily) or azithromycin (5 mg/kg [maximum 250 mg] once daily) in conjunction with ethambutol hydrochloride (15 mg/kg [maximum 900 mg] once daily), with or without rifabutin (5 mg/kg [maximum 300 mg] once daily). In patients with impaired renal function, doses and/or frequency of administration of ethambutol hydrochloride should be modified in response to the degree of renal impairment. Some clinicians suggest that if the creatinine clearance is 70-100 mL/minute, dosage of ethambutol hydrochloride should not exceed 15 mg/kg daily, and if the creatinine clearance is less than 70 mL/minute, dosage should be further reduced. Other clinicians have suggested that the usual dose be administered every 24-36 hours in patients with creatinine clearances of 10-50 mL/minute and every 48 hours in patients with creatinine clearances less than 10 mL/minute. The most important adverse effect of ethambutol is optic neuritis with decreases in visual acuity, constriction of visual fields, central and peripheral scotomas, and loss of red-green color discrimination. The extent of ocular toxicity appears to be related to the dose and duration of ethambutol therapy. However, such toxicity also has been reported rarely after only a few days of therapy with the drug, and may represent an idiosyncratic reaction. Tests for visual acuity should be performed using a Snellen eye chart prior to and periodically during ethambutol therapy. Changes in visual acuity may be unilateral or bilateral; therefore, each eye must be tested separately and both eyes tested together. During 1-2 years of ethambutol therapy, some patients may develop a refractive error which must be corrected in order to obtain accurate test results; testing visual acuity through a pinhole eliminates the refractive error. When ocular toxicity is detected early and ethambutol is discontinued promptly, the visual effects are generally reversible over a period of weeks or months. Patients have then received ethambutol again without recurrence of loss of visual acuity. Rarely, depending on the degree of impairment, recovery may be delayed for up to 1 year or more, or the effect may be irreversible. Care should be taken to be certain that variations in vision are not caused by underlying pathologic conditions (e.g., optic neuritis from other causes, cataracts, recurrent ocular inflammatory conditions, diabetic retinopathy). Other adverse effects of ethambutol include dermatitis, pruritus, headache, malaise, dizziness, fever, mental confusion, disorientation, possible hallucinations, joint pain, and rarely anaphylactoid reactions. GI upset, abdominal pain, nausea, vomiting, and anorexia have also occurred occasionally with ethambutol. Peripheral neuritis, with numbness and tingling of the extremities, has been reported infrequently. Increased serum uric acid concentrations and precipitation of acute gout have occurred occasionally in patients receiving ethambutol and are probably the result of decreased renal clearance of urate. Transient impairment of liver function, as indicated by abnormal liver function test results, has also occurred. Cholestatic jaundice, which appeared to be caused by ethambutol, has been reported in at least one patient who received the drug both alone and in conjunction with streptomycin. Visual testing should be performed prior to initiating ethambutol therapy and then periodically during therapy with the drug. Testing should be done monthly in patients receiving more than 15 mg/kg daily. Examinations should include ophthalmoscopy, finger perimetry, and testing of color discrimination. Patients developing adverse ocular effects during ethambutol therapy may show subjective visual symptoms either before or simultaneously with decreases in visual acuity. All patients receiving the drug should be questioned periodically about blurred vision and other subjective visual symptoms and should be instructed to report to their physicians any such changes as soon as they are noticed. If substantial changes in visual acuity occur, ethambutol should be discontinued immediately. Renal, hepatic, and hematopoietic tests should be performed periodically during long-term ethambutol therapy. Ethambutol should be used with caution and in reduced dosage in patients with impaired renal function. The drug should also be used with caution in patients with ocular defects (e.g., cataracts, recurrent ocular inflammatory conditions, diabetic retinopathy) that make visual changes difficult to detect or evaluate; consideration should be given to whether the benefits of ethambutol therapy justify the possible ocular effects in these patients. Ethambutol is contraindicated in patients with optic neuritis unless clinical judgment deems it necessary that the drug be used. Ethambutol is also contraindicated in patients with known hypersensitivity to the drug. The manufacturer states that ethambutol should not be used in children younger than 13 years of age. The American Thoracic Society (ATS), US Centers for Disease Control and Prevention (CDC), and Infectious Diseases Society of America (IDSA) state that ethambutol should be used with caution in children in whom it may be difficult to monitor visual acuity (e.g., those younger than 5 years of age). These experts state that ethambutol usually is recommended for use in such children only when the strain of Mycobacterium tuberculosis involved is known or suspected to be resistant to isoniazid or rifampin or when the child has adult-type (upper lobe infiltration, cavity formation) tuberculosis. Ethambutol has caused teratogenic effects in animals when used in high doses. Although safe use of the drugs during pregnancy has not been definitely established, ethambutol (combined with isoniazid or with isoniazid and rifampin) has been used to treat clinical tuberculosis in pregnant women and has not been reported to date to cause adverse effects on the fetus The manufacturer states that ethambutol should be used during pregnancy only when the potential benefits justify the possible risks to the fetus. The ATS, CDC, and IDSA state that ethambutol is considered safe for use in pregnant women. Ethambutol is bacteriostatic in action. Although the exact mechanism of action has not been fully elucidated, the drug appears to inhibit the synthesis of one or more metabolites in susceptible bacteria resulting in impairment of cellular metabolism, arrest of multiplication, and cell death. Ethambutol is active against susceptible bacteria only when they are undergoing cell division. Ethambutol is a highly specific agent and is active only against organisms of the genus Mycobacterium. The drug is active in vitro and in vivo against M. tuberculosis, M. bovis, M. marinum, and some strains of M. kansasii, M. avium, M. fortuitum, and M. intracellulare. In vitro, the minimum inhibitory concentration (MIC) of ethambutol for most susceptible mycobacteria is 1-8 mcg/mL, depending on the culture media used. Natural and acquired resistance to ethambutol have been demonstrated in vitro and in vivo in strains of M. tuberculosis. In vitro, resistance to ethambutol appears to occur in a stepwise manner. Resistant strains of initially susceptible M. tuberculosis develop rapidly if ethambutol is used alone in the treatment of clinical tuberculosis. When ethambutol is combined with other antituberculosis agents in the treatment of the disease, emergence of resistant strains may be delayed or prevented. There is no evidence of cross-resistance between ethambutol and other antituberculosis agents currently available in the US. Approximately 75-80% of an oral dose of ethambutol hydrochloride is rapidly absorbed from the GI tract. Absorption is not substantially affected when the drug is administered with food. Following a single oral ethambutol hydrochloride dose of 25 mg/kg, peak serum ethambutol concentrations of 2-5 mcg/mL are attained within 2-4 hours; serum concentrations of the drug are undetectable 24 hours after the dose. There is no evidence that accumulation of the drug occurs when ethambutol doses of 25 mg/kg are given once daily in patients with normal renal function. Serum concentrations of the drug are higher and accumulation may occur when ethambutol is used in patients with impaired renal function. An agar-diffusion microbiologic assay may be used to determine serum and urine concentrations of ethambutol. Although the technique of this assay has not been published, it is based on inhibition of M. smegmatis (ATCC 607) and specific information can be obtained from the manufacturer (Lederle). Ethambutol is widely distributed into most body tissues and fluids. Highest concentrations of the drug are found in erythrocytes, kidneys, lungs, and saliva; lower drug concentrations are found in ascitic fluid, pleural fluid, brain, and CSF. Peak intracellular concentrations of ethambutol in erythrocytes are about twice peak plasma concentrations and maintain this ratio for at least 24 hours after a single oral dose. In patients with meningitis, administration of an oral ethambutol hydrochloride dose of 25 mg/kg has produced peak CSF concentrations of the drug ranging from 0.15-2.0 mcg/mL. Ethambutol crosses the placenta and is distributed into cord blood and amniotic fluid. Ethambutol is distributed into milk in concentrations approximately equal to plasma concentrations of the drug. At a concentration of a 4.8 mcg/mL, ethambutol is approximately 8% bound to plasma proteins; at a concentration of 1.3 mcg/mL, the drug is approximately 22% bound to plasma proteins. The plasma half-life of ethambutol is approximately 3.3 hours in patients with normal renal function. The half-life is prolonged in patients with impaired renal or hepatic function. In patients with renal failure, the half-life may be 7 hours or longer. Ethambutol is partially inactivated in the liver by oxidation to an aldehyde intermediate, 2,2-(ethylenediimino)-di-butyraldehyde, which is converted to the decarboxylic acid derivative, 2,2-(ethylenediimino)-di-butyric acid. Within 24 hours, approximately 50% of an oral dose of ethambutol hydrochloride is excreted in urine as unchanged drug, and 8-15% is excreted as inactive metabolites. Unabsorbed ethambutol is excreted in feces as unchanged drug. Approximately 20-22% of an oral dose of the drug is excreted in feces as unchanged drug. Ethambutol is removed by peritoneal dialysis and to a lesser extent by hemodialysis. Ethambutol hydrochloride is a synthetic antituberculosis agent. The drug occurs as a white, crystalline powder and is freely soluble in water and soluble in alcohol. The drug has pKas of 6.1 and 9.2. Ethambutol hydrochloride tablets should be protected from light, moisture, and excessive heat and should be stored in well-closed containers at 15-30°C. How can i get Ethambutol online over the counter? You can buy Ethambutol OTC in online drugstore with low cost.